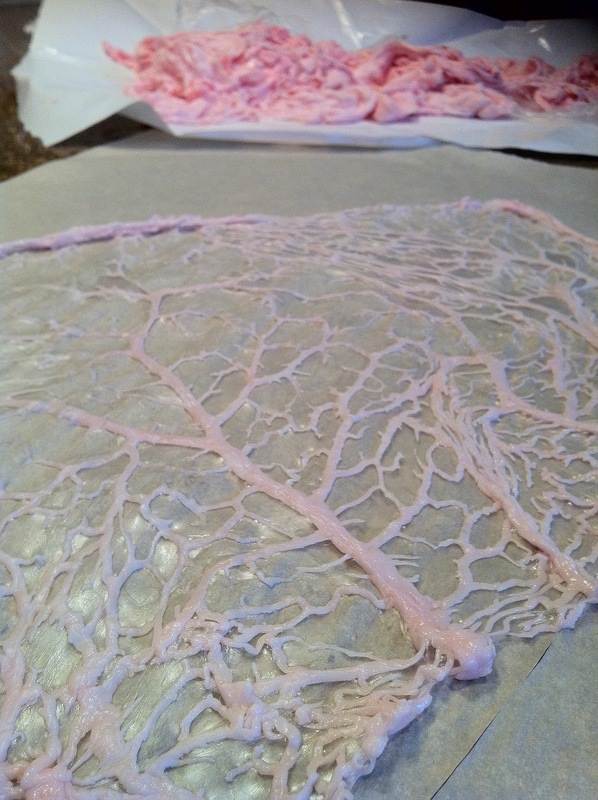 Note: The farm (Rehoboth Farms) where I've been getting our meat and eggs was unable to sell me the caul fat (according to their processor, the USDA wouldn't allow it), so I had to search it. I found it at Hirsch's Meats in Plano, TX (may be helpful if you live in the area and want to experience the wonder that is caul fat). Otherwise, seek out a local butcher who receives the full animal and is able to process it as they see fit. You should be able to get it for around $1-1.50/lb. 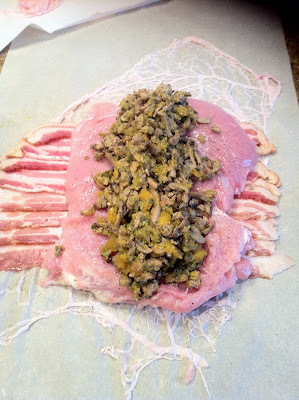 Lay a large piece of caul fat out on a large, flat work surface (I laid out a piece of parchment paper, which made rolling a lot easier). 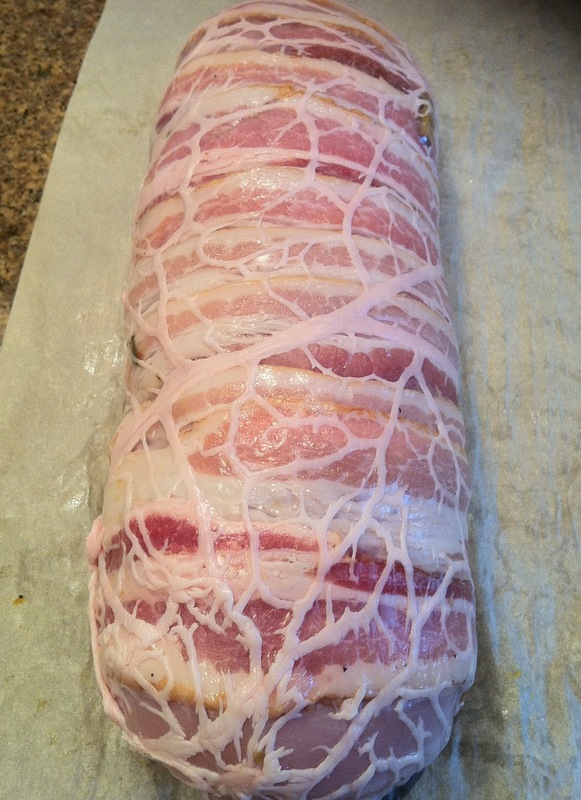 Lay about 10 bacon slices in the middle, slightly overlapping. 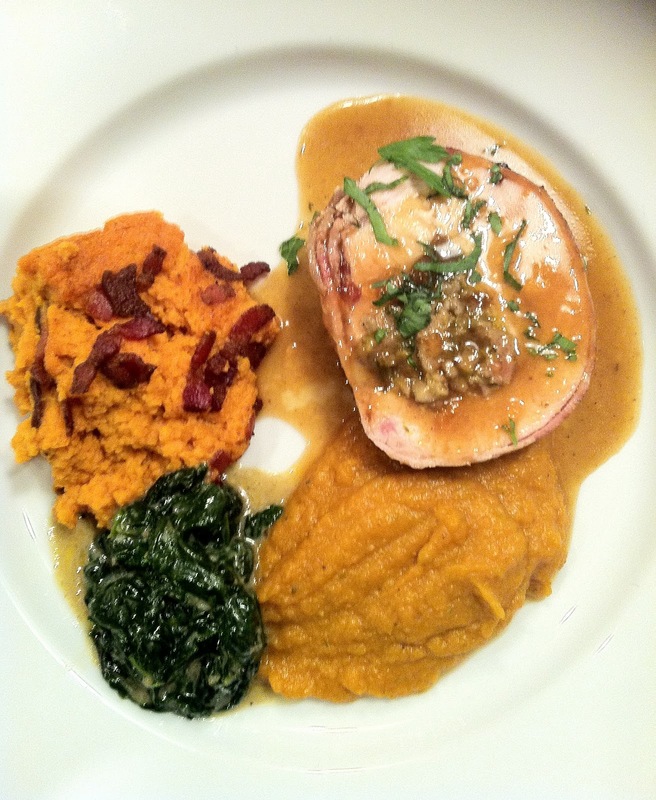 Arrange a turkey breast on top. Lay half the stuffing mix on the turkey and roll it up, creating a neat even log. Wrap 2 pieces of bacon around each end, then fold the bacon that's underneath around the turkey. 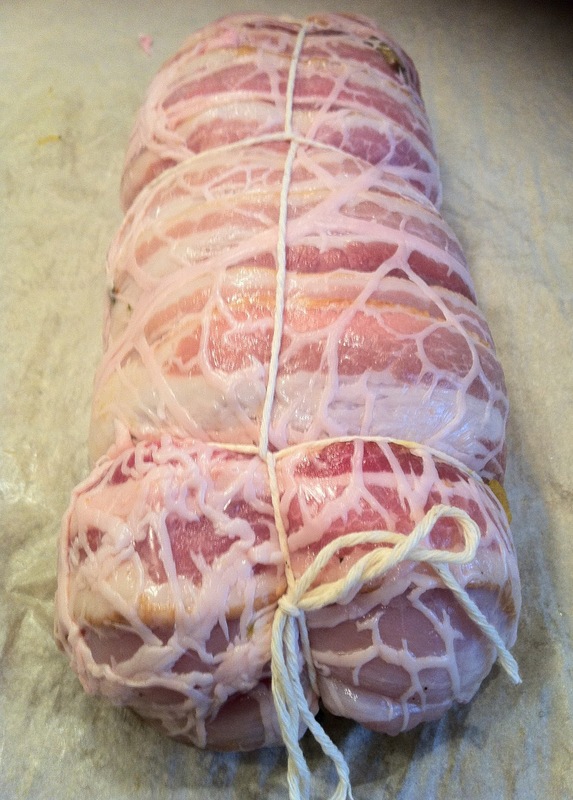 Wrap the caul fat in an even layer to create a smooth even log. Tie with twine to secure. Repeat with second turkey breast. 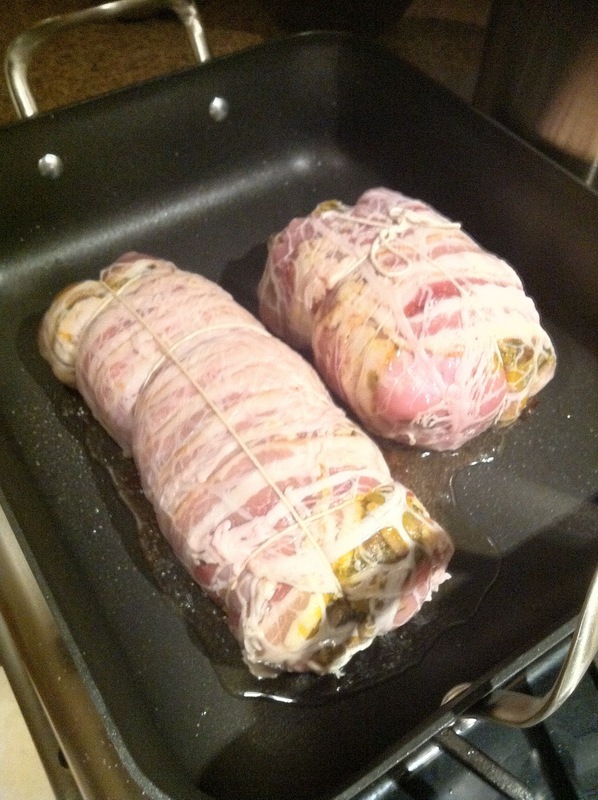 Put a large roasting pan on a burner, coat it with olive oil and heat over medium-high heat. Add the turkey rolls and brown on all sides. 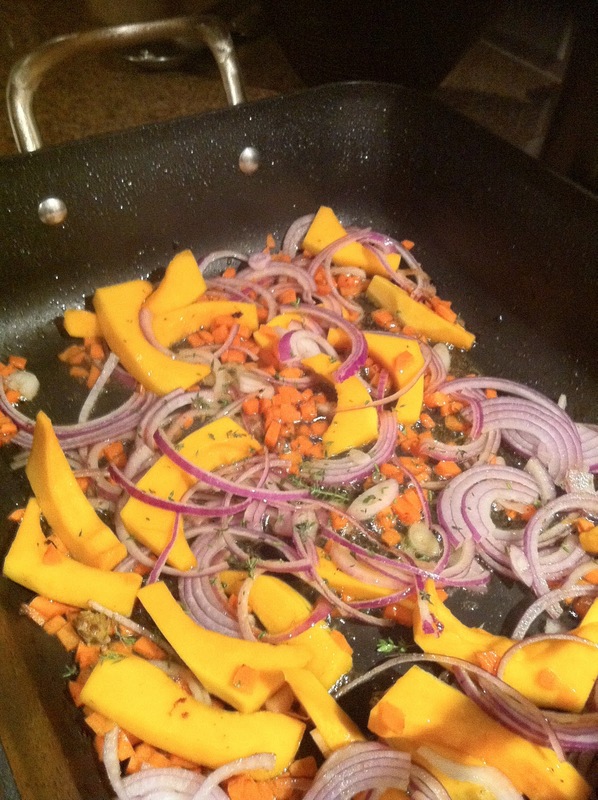 Remove the rolls from the pan and add in the onion, carrots, celery, butternut squash, and thyme. Season with salt, to taste, and cook the veggies until they start to soften, about 7 to 8 minutes. Add chicken stock and white wine (if using) to the roasting pan with the thyme. Return the turkey rolls to the pan, cover with foil and roast for 25 minutes, remove the foil and roast for 10 more minutes. 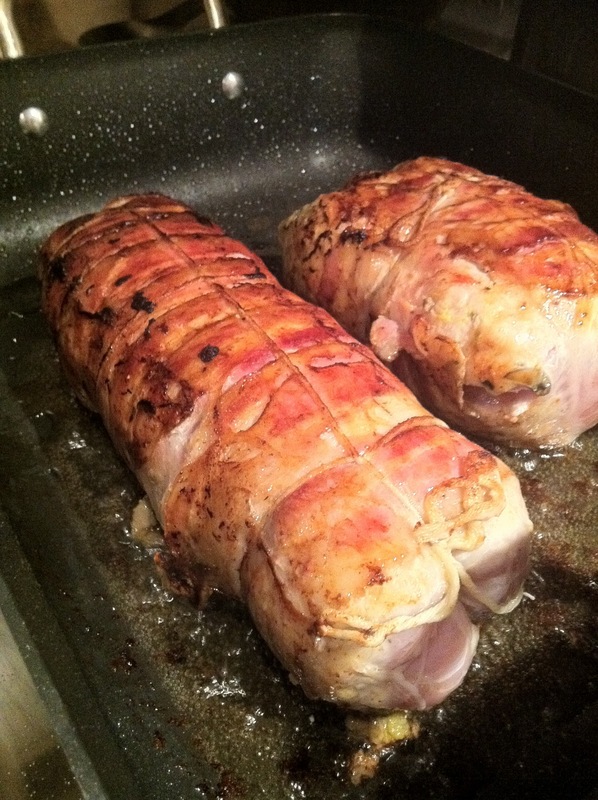 Remove the pan from the oven and transfer the turkey to a tray or platter and cover with foil to rest and keep warm. Strain pan sauce through a sieve, reserve vegetables, and transfer sauce back to the pan, to reduce. Put the roasting pan over 2 burners to make the gravy. Bring the sauce to a boil, whisking regularly. Reduce the heat and simmer until the mixture has thickened to a gravy consistency. Taste and season with salt, if needed. While gravy is thickening, puree vegetables. The twine will help keep everything nicely bundled. You can use any combination of veggies; this was really good. Wings and Legs- will be roasted next week. The Carcass- used for making stock. The Breast- used in this recipe. **The wine isn't necessary, but adds a nice acidity. If you omit, add an additional 1 cup of chicken stock and a squeeze of lemon or a splash (1T.) of apple cider vinegar.